When tendons become trapped under the acromion, the rigid bony arch of the shoulder blade, it can cause shoulder pain called impingement syndrome. 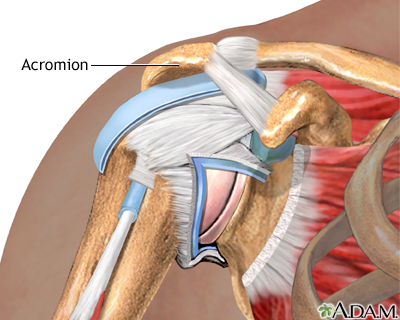 The tendons become compressed, damaged, and inflamed leading to rotator cuff tendonitis. This can occur from general wear and tear as you get older, or from an activity that requires constant use of the shoulder like baseball pitching, or from an injury.